Are you looking for a smudge-free, dramatic eyeliner look? We are now offering a thick semi-permanent eyeliner look, complete with Latino-style flick if desired! The appointment takes around 2.5hrs (which includes a consultation and design time) and includes a refill treatment 4-12 weeks later to ensure a perfect result. Enquire today and save time in the morning! Carrina has joined Karen Betts! I'm absolutely over the moon to be able to announce that as from August, I will be working for Karen Betts as part of her elite team in Harley Street and Cheshire! Carrina goes to Pure Pigmentation Clinic! ​It is with great pleasure that I can now announce that I have been selected to work at the Pure Pigmentation clinic in Kenley, Surrey, where I will be performing treatments on a weekly basis to assist the lovely Hanna during her maternity leave. I will be introducing Brow Microblading to her treatment list, and I’m super excited to meet the clients and give them confidence-boosting brows! I will be at Pure Pigmentation on Thursdays initially, so will still have plenty of time for my Watford clients on Tuesdays, Wednesdays and Sunday. Keep an eye out for some amazing work coming from this collaboration, as well as for the pitter-patter of brand tiny new feet! "I want my brows to be symmetrical"
Symmetry has long been seen as an example of beauty, and many models and celebrities are hailed for their mirror-image good looks. In reality however, a perfectly symmetrical face does not exist, and no two sides of the face are the same, even for the rich and famous. Look closely enough at a portrait image, and you’ll see the subtle differences between left and right - a rounder eye socket, or a stronger jawline perhaps. One side of the face is often slightly wider than the other side, or one eye positioned slightly lower or higher. Take a mirror image of both halves of your face in a photo, and you may find that your character is made up of two entirely different people! All of these factors contribute to the look of the eyebrows and what can be achieved in a treatment. Whilst a good technician will take precise measurements of your brows in order to position the enhancement and achieve as much balance as possible, the canvas of your face will dictate how symmetrical the result will be. 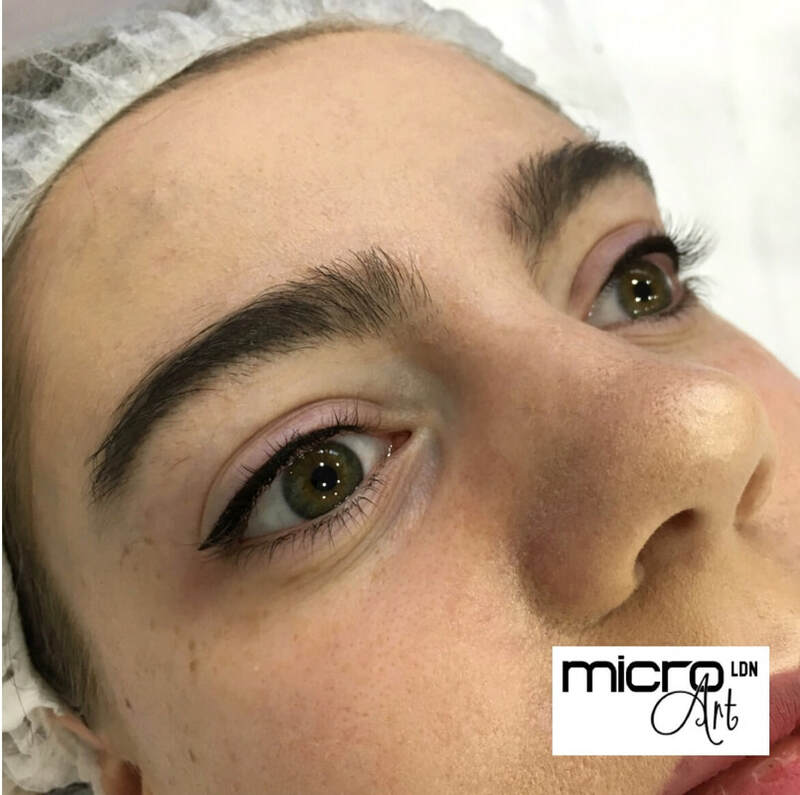 For a free consultation with Micro Art LDN, where your brows will be measured and assessed for the most flattering result, please call 07749749149 or email microartldn@gmail.com. "They must be the best, because they've been doing it for years"
​It is easy to assume that the longer a technician has been qualified, the more experienced and skillful they will be at creating enhancements. However, clients need to take into consideration how many treatments that person performs, and on how regular a basis. A technician that qualified in 2012 might have 5 years of owning the title of ‘permanent makeup artist’, but they may only have been performing 2-3 treatments a month. In contrast, a technician whom performs several procedures a day on a weekly basis, despite only having had a year or two in the industry, may be more experienced and skillful due to the fact that they are consistently in the skin. Artistic flare and natural creativity play a big part in producing a successful and flattering enhancement, and having an eye for detail, symmetry and balance is sometimes something that must be possessed rather than learnt. Clients should request to see a technician’s portfolio before making a decision to pursue treatment, including images of their healed work. Social media is a great method of determining whether a technician performs treatments regularly. Do they post new work often? Are they performing treatments on a wide range of skin colours/types/ages? Do they update in regards to extra training or courses that they have undertaken? Do they have good reviews from previous clients? Remember, no amount of artistic skill can make up for poor standards, so it is still imperative to confirm that your technician is licenced, insured and working to the highest of hygiene standards. For more information on treatments at Micro Art LDN, please visit www.microartldn.com/treatments to view the full portfolio. Regular updates and reviews are posted on Facebook at www.facebook.com/microartldn. 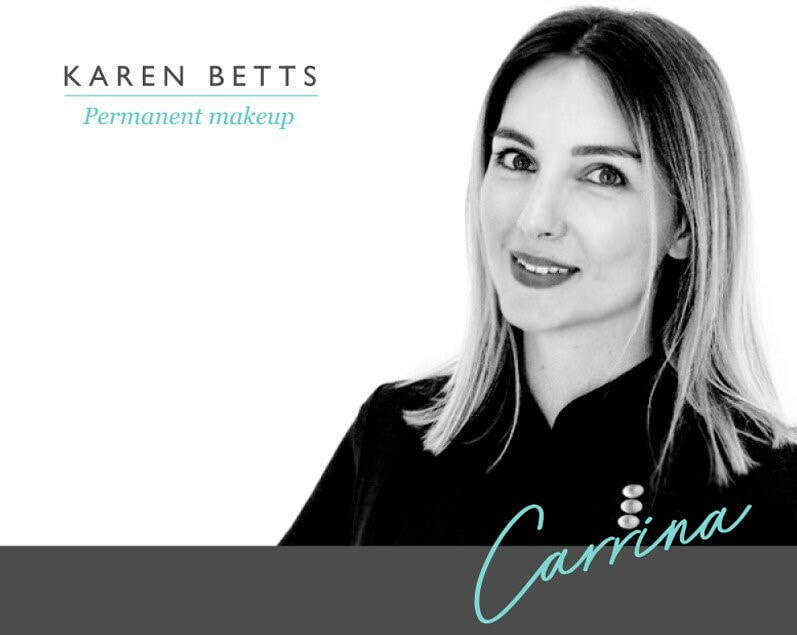 Carrina performs treatments on a daily basis, 4 days a week for the Sian Dellar Evanescence Clinic in Harley Street, and on Wednesdays and Sundays for Micro Art LDN. 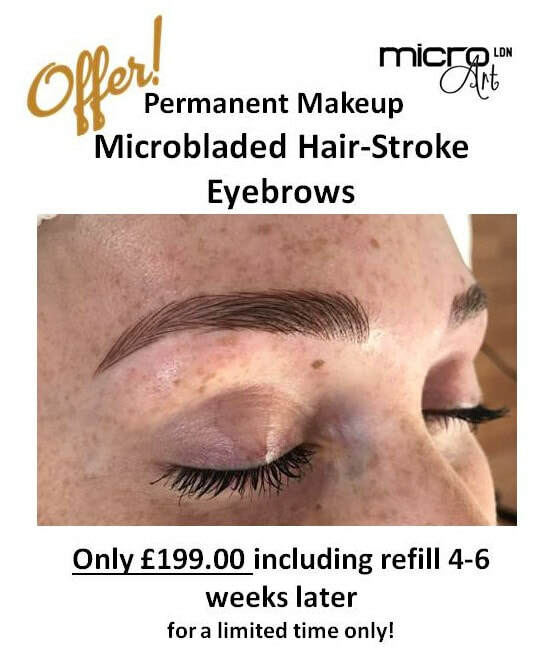 £199 Hair-Stroke brow enhancements using a Microblading technique - with inclusive refill! Get natural-looking, smudge-free microbladed eyebrows for £199 for a limited time only! "What's the difference between microblading and permanent makeup?" Clients often ask what the difference is between 'Microblading' and 'Permanent Makeup', having heard many myths that one technique is more superior than the other. In fact, both methods of micropigmentation are highly effective at creating beautiful enhancements, and if performed by a reputable, trained and licenced technician, can achieve safe and successful results for clients. Microblading is a technique that originates from Asia, and is sometimes known as "eyebrow embroidery" or "microstroking". The pigment is 'scratched' into the upper dermis of the skin, depositing pigment in crisp, clean strokes that mimic natural brow hair using a hand tool comprised of a series of fine needles fused together in a curvilinear grouping. The tool can also be used to create shading and powder/mist brows, by using a tapping technique. Generally, microblading treatments last between 6-15 months in the skin, and requires a yearly refresh. Treatments are usually quicker to perform - sometimes taking as little as 20 minutes for the actual implantation process. Machine Permanent makeup, also known as "semi permanent makeup" or "cosmetic tattooing", uses an electronically powered device and handgun which deposits pigment into the dermis using fine needles that repeatedly 'prick' the skin, penetrating slightly deeper in the skin than the microblade. This method can be used to draw fine hair strokes, shade and create powder/mist brows by using different needle configurations or tapers. Generally, machine permanent makeup lasts between 1-3 years, but a yearly refresh is recommended. Treatments usually take longer than microblading, as the needle needs to be moved slowly and consistently over the skin to implant smoothly. Machine implantation is usually required for the creation of eye and lip enhancements, although microblade versions of these treatments are beginning to appear. Blurring of pigment will occur over time, due to the process of phagocytosis (because pigment molecules are 'foreign invaders', the body produces antibodies called macrophages that engulf pigment molecules and try to carry them away to blood/lymph vessels for expulsion, where they get stuck) This cause strokes to become slightly softer, thicker and less crisp as the enhancement ages. Non-toxic micropigmentation pigments should be used, which are designed to fade slowly and naturally whilst staying true to the original colour. NEVER should tattoo inks be used on the face, which are unstable and can result in unsightly blue/green/purple colour changes. UV light will cause premature pigment fade, as will extrinsic factors such as diet, environment and skincare routines. Stringent aftercare must be followed, and the enhancement kept dry and protected with healing balm for 10-14 days post procedure for the best results. It goes without saying that whatever method a client chooses for an enhancement, whether machine or microblade, researching into the technician, premises and standard of equipment is key. There is good and bad work in either technique! 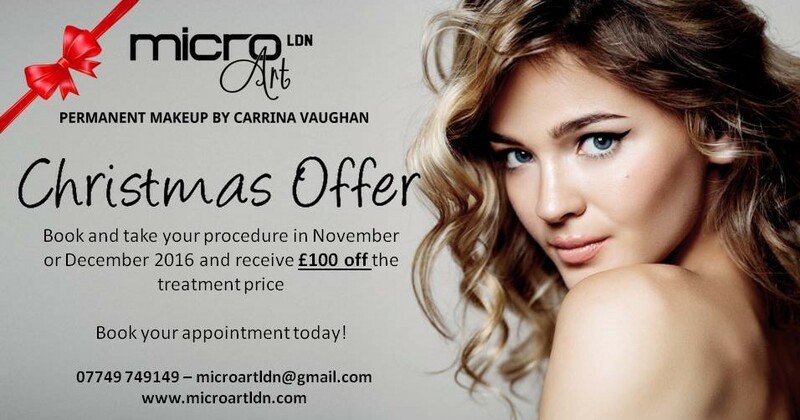 For more information, please contact Carrina at Micro Art LDN for a complimentary, no obligation consultation where your questions and concerns will be addressed and you can find out the best method of enhancement for you. 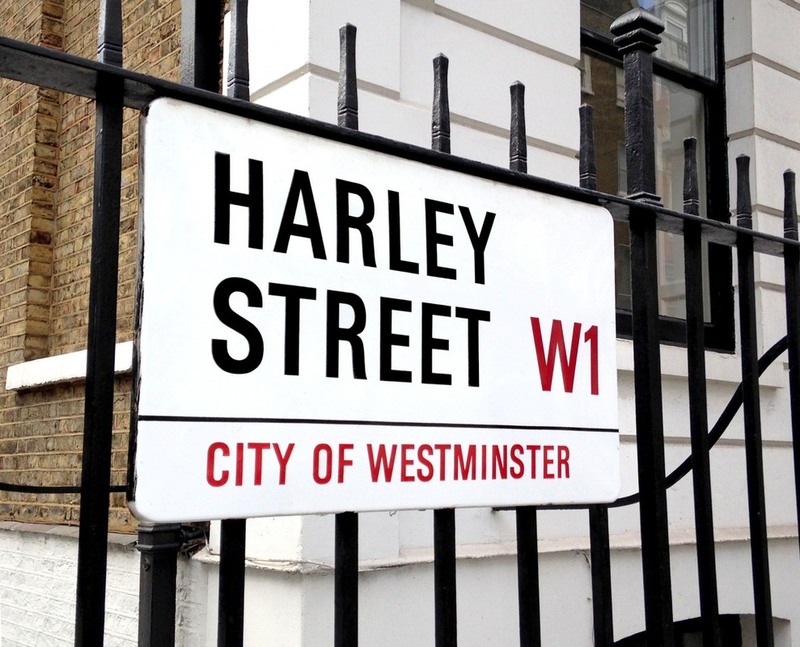 Carrina goes to Harley Street! It is with great pleasure that I can now announce that I have been selected to work at the prestigious Evanescence Clinic in Harley Street, alongside permanent makeup specialist, Sian Dellar! But don't worry - I will still be performing treatments for my own clients from Create Your Beauty in Watford on Wednesdays and Sundays, so make sure you secure your appointment in advance! And keep your eyes peeled on my Facebook and Instagram pages for more exciting updates! Get defined, dense-looking brows this summer with the NEW Ombré Powder Brow Technique! Brows heal 30-40% lighter to a soft, graduated, powdery makeup finish, for clients who want their brows 'on fleek'. 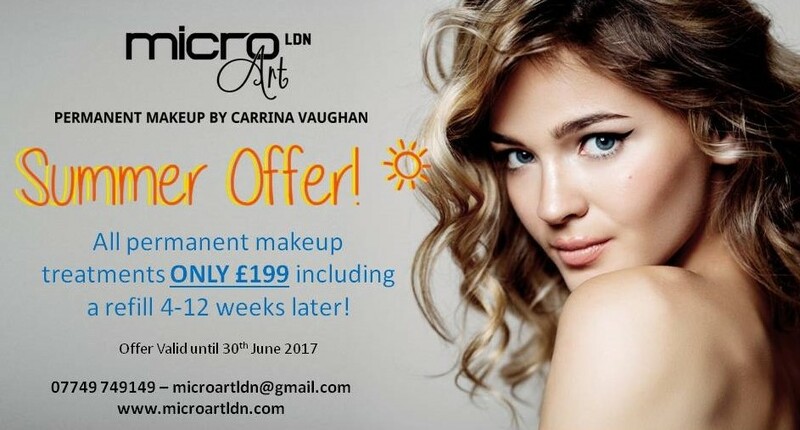 Book now, and the Ombré Powder Brow is included in the £199 Summer offer until 30th June 2017! Summer Offer time - Get any Permanent Makeup treatment for £199! If there were ever a time of year that Permanent Makeup really makes a difference, then Summer would be that time! In the season of sweaty faces, swimming pools and long lazy days on sandy beaches, Permanent Makeup can give you the confidence of a made-up face without the worry of smudges or streaks. Book in for a FREE, no obligation consultation to see how an enhancement can benefit you, and if you decide to proceed, then you can choose any enhancement for only £199 until the end of June. Remember - it takes 4 weeks for a procedure to full heal before the touch-up refill can be performed, so make sure you book in plenty of time of your holidays! "Its only a little procedure, you won't need a patch test"
Sensitivity testing for pigments can cause controversy in the permanent makeup industry, simply due to the fact that it is possible for the skin to develop a delayed allergic reaction to pigment even though the initial test proved negative. However, a reputable and responsible technician should provide a patch test to all new clients regardless, not only to cover all bases, but also because insurance companies insist on it - even for the smallest of beauty spots. If a technician is fobbing off the need for a pre-procedure patch test, you need to ask yourself - what other rules do they break? In fact...do they even have insurance at all? Micro Art LDN will always insist on providing a patch test for the Biotek pigments and numbing agents used, either via direct application at consultation or via a spot plaster. "They perform their treatments in a 100% sterile treatment room"
Strict hygiene is key when it comes to a procedure where the skin’s barrier is broken. Even small infections can affect the healing of an enhancement, whilst transmission of diseases can damage the health of both client and technician. It’s important when choosing where to have your enhancement done that you look at the premises and question the technician on their health and safety practices. No procedure room is ever going to be “100% sterile” – if an operating theater in a hospital cannot claim to be guaranteed sterile, then it is very unlikely that this environment is going to be achieved in a beauty salon or a spa. Sterilisation is a process that eliminates all micro-organisms, including fungi, bacteria, viruses and spores, and whilst single pieces of equipment can be sterilised via pressure boiling over 120 degrees centigrade (such as in an autoclave), it’s very difficult to achieve that across a whole room. However, there are things that the client can be on the lookout for. The procedure room should have walls and a floor that can be easily wiped down with disinfectant. Carpets, wallpaper and curtains should be removed, seeing as they can harbour bacteria, and be difficult to clean. Treatment couches should be smooth and made of a non-absorbent material, so that they can be easily wiped down. There should always be hand-washing facilities available, and a proper disposal method for hazardous waste. Most councils will require a premises to be licensed before treatments can be performed, and a health inspector will examine the facility to ensure that it meets safety criteria. You can always ask to see a copy of the licence certificate, which should be displayed on site.